Standard's Modular Series were designed for "simple function" coin dispensing. But don't let that term fool you. 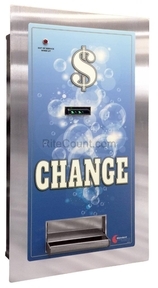 These changers are excellent coin & tokens change machines, and offer a variety of 'plug & play' options to help you customize the machine to your specific business needs. For example, most Modular series machines are supplied with Coinco Vantage bill acceptors, but are also compatible with the Mars (MEI) AE2600 Series, Pyramid APEX-7400 series or Cashcode Currenza bill acceptors. Standard's MC Series currency changers provide the ultimate in flexibility in a low-cost solution. The MC400RL is a versatile machine that can be used in small commercial coin laundries or car washes for use with self-serve bays or for vacuums and vendors. With two steel coin hoppers, holding up to 6,400 quarters ($1,600 capacity), and the solid welded steel cabinet has a stainless steel faceplate for added security. The MC400RL can dispense coins, tokens or a combination of coins and tokens. Non-Resettable Counter Pkg. (2) Pkg.